This is another family favourite. It is a very simple dish to make (at least when you use a food processor) and pretty open to modification. If I make a big enough batch then there will be enough left for dinner another night as well. Put one onion through food processor and pulse til fine. Add one can of chickpeas (or about 2 cups worth of soaked and cooked chickpeas) and pulse til smooth. Add 1 container of ricotta cheese, 1 egg, lots of fresh chopped parsley, salt, pepper, garlic and some Romano or Parmesan cheese. Process 'til smooth. 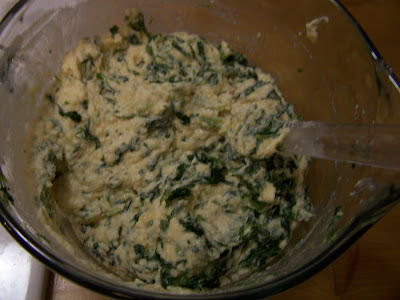 If I have it I like to add some steamed spinach or some grated zucchini at this point and fold that in. This batch has spinach. 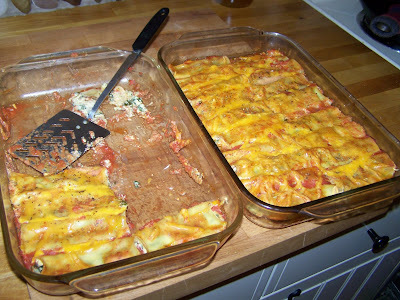 I put this mixture into a plastic bag with a small hole snipped into the corner of it and then squeeze it into no-bake (oven-ready) cannelloni shells and place them into a baking pan. Over this I pour my spiced tomato sauce (you could use your favourite tomato-based pasta sauce) which has been thinned out with water. (There are instructions on the package of cannelloni shell for how much water to add to the sauce. The sauce must be watery enough that it helps cook the shells.). Sprinkle some grated cheese on top. Cover and bake following package directions. I like to take the lid off for the last few minutes to brown up the cheese a bit. Enjoy. Looks great I'll try this one too. Homemade ricotta sounds delicious; another thing to add to my list of "things to try". Our containers are just under 500 ml so using 2 cups should do it. The recipe is pretty adaptable so you could always use more.